Quiches are an oldy but a goody and we’re taking advantage of that oldy tonight. 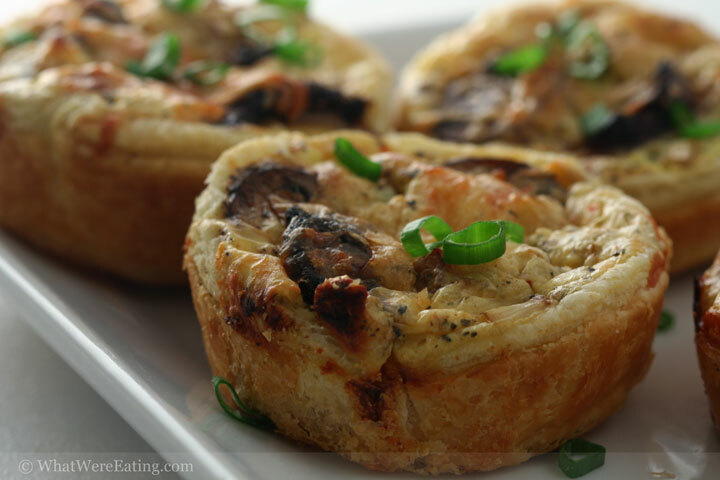 Dinner consisted of mini-quiches in puff pastry shells with crumbled feta, pepperoni, sauteed crimini mushrooms and leeks, and a sprinkling of italian blend cheese. To lighten the meal up a bit we served a basic romaine salad along side. T: Ooowee these things were rockin’! It’s been forever since you made any tasty little quiche things, and I’m glad to see them back again. Yeah! A: no joke! when we lived in baton rouge i was on a quiche kick. there was a period where i was making at least one quiche a week! that’s a bit out of control but they’re just so damn tasty. T: They really are very very tasty. Are they tricky to make? T: woah woah… wait a sec. Egg substitute? I’m afraid. Those things tasted good, but I’m still a little afraid of what an egg substitute might consist of. A: actually it’s 100% egg, but not eggs in the shell, you know? i didn’t want to brand drop but i used egg beaters. it’s mainly egg white with a touch of yolk i think. T: ok, so it would have been the same to just take out the yolk of real eggs? T: You shook and poured well I must say. I give these a 4.7/5. I could eat these every day… for at least a couple of months. They were so flavorful, and had a great texture too. I like the flaky outsides. The pepperoni really set them off though. What’s your rating? A: i agree with you, i loved the crap out of these things. just simple quiches in puff pastry shells but still taaaastyyyy. I give ’em a 4.6/5. the pepperoni and feta went great with the sauteed mushrooms and leeks. i was a little apprehensive about using egg beaters initially but it worked out great. i don’t remember why i got off the quiche kick but it looks like i might be back on. T: hell. yes. Bring it. Hey, just a thought- these might be good for your brownbag lunches, huh? A: actually, while you were typing earlier i was thinking exactly that! or for both of our breakfasts. they would be great for a grab and go any time! dude. i can’t tell you how utterly sick of ham on wheat sandwiches i am. like take vomitously sick and multiply it by a billion and that’s how sick of them i am. T: Been there done that. I’ve reached that point with ham, turkey, and pb&j in the past. Move on, Amanda, and don’t look back. You’ve made your last crappy ham sandwich. Rejoice. A: i’m starting the “freedom through mini-quiches” movement! are you on board? oh my dang it. those look freaking great. Mmm you won’t mind if I swipe a couple, one for each hand? yum. puff pastry should always be in everyone’s freezer for throwing together meals like this. my personal fav: leftover chilcken pot pie filling made into little half-moon dumplings with puff pastry. but now i don’t want to eat the sandwich i brought for lunch. Alright, Amanda. I’m ready for more. It has been long enough. ……….. still waiting. Whenever you’re ready. Alright. Now would be great. In my house it was always frittatas instead of quiches, so that’s what I’ve gotten used to making. I do love a good quiche on a Sunday morning though, and these mini ones look like they’re just right. 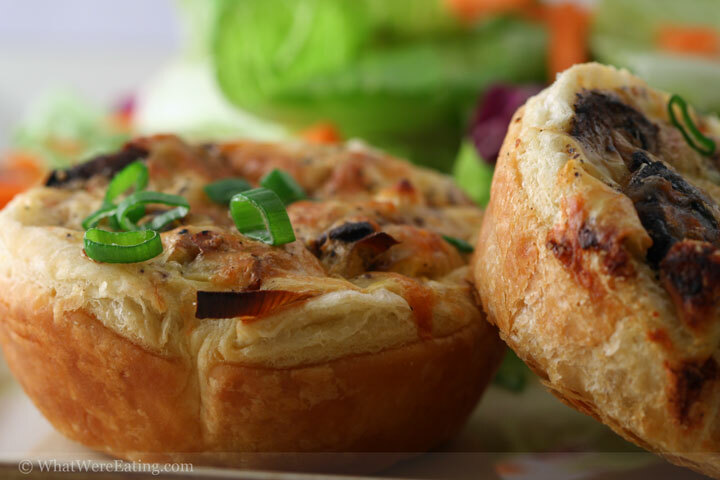 I’ve been craving quiche recently…it’s like you were reading my mind! Coming Soon. And by soon we mean not soon. What a great “conversational” post. You guys are so fun to read and to visit. We want to add you to our blogroll, but putting you guys in the general category is not enough. We’re going to create a blogroll dedicated to awesome couples to eat, cook…and converse with each other on their post! nicole, i did use a muffin pan. i cut out round pieces of puff pastry with the largest ring mold i had and just kind of free formed the crust. when given the chance, i will always choose something with a crust rather than w/o! thanks sues! judging from my back-up in recipe writing and currently busy schedule, i don’t know when the recipe is gonna go up, but quiche is always mega easy to make! hehehe i love it cheila! hogs and quiches! i’m totally stealing that. of course not Bron… if i you lived close by i would make up a batch just for you and your girls! no quiches for you T! you’ve had enough! thanks susan! if i was trying to be healthier i would go fritatta, but you know me… i love me some buttery crusty goodness! i like how your thinking brilynn! puff pastry makes everything better. ham sandwiches included. you know, maybe i’ll have to make a sandwich using some baked-off squares of puff pastry for the bread. i would definitely have to use your name in it’s title. jen v, great minds think alike. are you thinking you would still like some quiche?…. because i am! thanks white on rice couple! i really really dig your sites too. all of them. it’s a great idea to make a blogroll for just couple bloggers. there are definitely a few of us out there. thanks melissa! we figured it was time for some more recent photos of us considering the other one was taken nearly three years ago! Our neighbor mowed his grass yesterday with his new John Deere riding mower, and matching John Deere ball cap. Today he is going over the yard again with the Snapper because it has a bagger. He is wearing his work uniform and work cap. He works at a plant. His wardrobe consists of a blue and white sport shirt, the kind with the vents in the back, as worn by pro bass fishermen, a pair of khaki pants, khaki shorts, khaki crocs, and a black shirt and black pants, with black boots, I think. The black outfit is only for when he is on the prowl. Once his prey is caught, its work clothes or the blue, white khaki ensemble. I believe the white shirt is for after memorial day, before labor day, and the blue vice versa. His sister has arthritis. Her ex-husband was my high school English teacher, but she divorced him before he was my teacher. She lives down the street and always looks constipated. I think her brother, my neighbor, may have some sort of brain damage. He also likes to wear his bluetooth ALL of the time, probably even in the shower. He could be a cyborg or something like that. I’ve found bugs in his program and got him stuck in a loop and he had to be rebooted. No one in the neighborhood really likes them, and never even bother to wave at either of them, which is bad because its a small town. Hey Amanda and Tyler! I tagging you guys for a meme–five sordid facts about you! Check out my blog for details. Hi again guys! We just posted our first cooking video. Come by for a visit anytime! Those look amazing – but Bobby needs to put a cork in it! I love your blog – the photos are gorgeous and make me want to eat everything! And I think I’ve mentioned it in an earlier comment – you guys are hilarious! Thank you for the good laugh! My favorite way to eat leftover cold quiche is to cube it and add it to a big salad – the best croutons ever! What a fantastic idea! Will make these for kids to take to school for lunch instead of the ever boring sandwiches!